A CNN photo illustration welcomes travelers to Topeka, which changed its name temporarily to attract a Google project. Google has announced a pilot program to speed up Internet access in the U.S.
(CNN) -- At 79, Bill Bunten doesn't exactly understand the Internet boom. The Topeka, Kansas, mayor has an e-mail account, he said, but his assistants take care of most of his online communications and tend to search the Web for him. But Bunten believes so firmly that younger residents of Kansas' capital city will benefit from faster Internet connections that he wants Topeka -- which he describes as a place of many lakes and the site of a burgeoning market for animal-food research -- to change its name for a month. 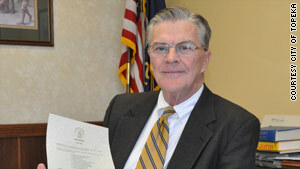 In a formal proclamation Monday, Bunten announced his city will be known as "Google" -- Google, Kansas. "It's just fun. We're having a good time of it," he said of the unofficial name change, which will last through the end of March. "There's a lot of good things that are going on in our city." The unusual move comes as several U.S. cities elbow for a spot in Google's new "Fiber for Communities" program. The Web giant is going to install new Internet connections in unannounced locations, giving those communities Internet speeds 100 times faster than those elsewhere, with data transfer rates faster than 1 gigabit per second. Bill Bunten is the mayor of Topeka, Kansas, which is informally going by "Google" for a month. Cities have until March 26 to tell Google they're interested in the venture. Google says it will pick one or more cities for the pilot project. "We'll offer service at a competitive price to at least 50,000 and potentially up to 500,000 people," Google says in an online post. The company has said U.S. Internet speeds are falling behind the global standard, and it wants to fix things itself by installing new broadband cable. Bunten hopes the proclamation, which he read at a special City Council meeting on Monday, will catch Google's attention and make the Internet company decide to use Topeka as its guinea pig. The document renames Topeka as "Google, Kansas -- the capital city of fiber optics." 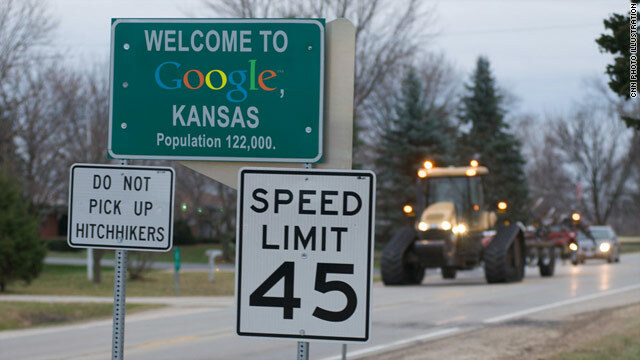 Google declined to comment on whether it's taking the whole "Google, Kansas" thing seriously. The mayor believes that faster Internet connections would inspire young people to stay in the city and would encourage business development. But Bunten laughed at the idea that he might make the name switch permanent if Google decides to invest in his 123,400-person city's Internet network. "Oh, heavens no, Topeka?" he said during a phone interview. "We are very proud of our city and Topeka is an Indian word which means 'a good place to grow potatoes.' We're not going to change that." Do people grow potatoes in Topeka these days? "I don't think we grow that many potatoes anymore," he said. "The crops we have out here are wheat and corn and soybeans and alfalfa. And, did I say soybeans?" This isn't the first time Topeka has switched its name to mark a cultural trend. In 1998, former mayor Joan Wagnon temporarily changed the name of the city to "ToPikachu, Kansas," in reference to the Pikachu anime character, from the show and game called "Pokemon," which was popular at the time, according to the Topeka Capital-Journal. Bunten, the current mayor, was quick to attribute that bizarre "ToPikachu" happening to another local administration. "I read in the paper this morning that they did a similar thing a number of years ago. Hold on, maybe I can get this sorted out. Just a minute," he said, turning to an assistant for details. "We did it for a day," he said, sounding perplexed. "I can't remember why." On its face, changing the name of a city to "Google" may seem like a silly publicity stunt, but Bunten says there is a serious side to the idea. Faster Internet connections might just be Topeka's ticket to a hipper future. He's the first to say outsiders probably view Topeka as "another Midwestern town with not a lot going on," but he's been making efforts to change that. He trying to revitalize downtown with a bar and music scene. Google would add to all that, making the city more attractive to youngsters, he said. "To have this high-speed where people can sit down and have lunch and still keep working is a positive for young people," he said. "The young people are the ones that caught onto this and go to the Internet and asked people in the city to sign on as supporting Google coming to Topeka." Bunten also hopes super-fast Web connections will improve the city's image with outsiders. He was quick to point out that, while Topeka is in northeastern Kansas and is geographically part of the Great Plains, the city is green and has hills and even lakes. It's not flat like the Kansas stereotype, he said. "Kansas is what it is, but I was trying to explain to you down in Atlanta that Topeka is not on the prairie. Our rainfall here runs about 32 inches a year. If you get out to Manhattan [Kansas], where Kansas State University is, well, it gets flatter. The wheat fields go as far as you can see. But here it's not. There's lots of trees and lots of water and we're going to develop this riverfront into something very, very nice," he said. Bunten was born in Topeka. He said he traveled with the military, visiting Japan, Korea, San Diego and Los Angeles, California, Washington state. He saw many nice places. But they were nothing compared to his home. They couldn't match the community. That's why he chose to return to his Topeka after years away. He hopes Topeka's young people will explore the world like he did. But he wants them to come back. And he hopes Google will be their magnet.